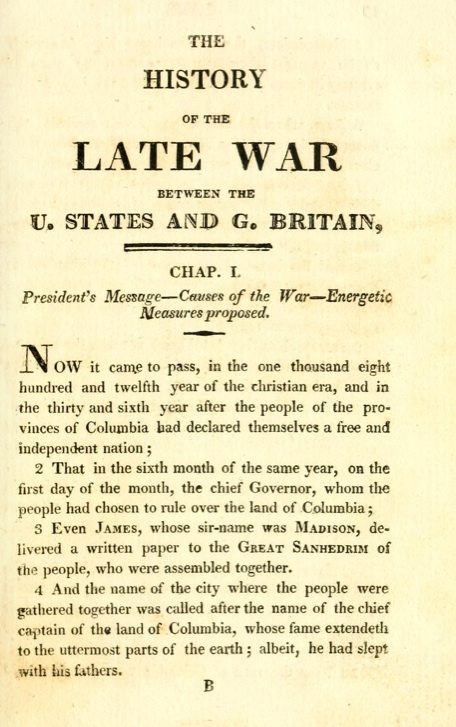 A 19th century book, The History of the Late War Between the United States and Great Britain, has been mentioned before now as a possible source for the Book of Mormon, most notably by Rick Grunder in his 2008 work, Mormon Parallels: A Bibliographic Source. But the suggestion that Joseph Smith may have used this book in his writing of the Book of Mormon hasn’t seemed to gain much traction until now. At the 2013 Ex-Mormon Conference in mid-October, former Mormon Chris Johnson presented findings he and his brother, Duane, uncovered in their study and analysis of a comparison of the two books. Mormon discussion forums and blogs are now in serious dialogue about how Gilbert Hunt’s 1819 New York textbook relates to the Book of Mormon, and in some cases more specifically, how it undermines the popular apologetic reliance on Hebraisms to substantiate the ancient origin of this Mormon scripture. Gilbert Hunt wrote The Late War in imitation of the “biblical style,” in the hope that any young student reading the book would acquire a love for the style and it would become “an inducement to him to study the Holy Scriptures.” Consequently, The Late War employs word structures and ancient-sounding language that reads very much like the Bible (KJV) – and the Book of Mormon. Some people see the strong Book of Mormon parallels in The Late War as proof that Joseph Smith, a person with easy access to Gilbert’s book, used it in composing the Book of Mormon – thus negating any pretense that the Book of Mormon is divine. Others merely shrug and dismiss the whole thing as unimportant. The actual significance of The Late War is more likely somewhere in between. Yet one thing is certain: Hebraisms found in the Book of Mormon do not prove a thing about its origin. In fact, they shouldn’t even be presented as any sort of persuasive evidence. On the Mormon Dialogue & Discussion board, canard78 asked, “There is clear evidence that the claimed Hebraisms found in the Book of Mormon are also found in 19thC literature. With the emergence of ‘The Late War…’ will there now be less emphasis placed on Hebraisms as evidence for the Book of Mormon as an ancient Hebrew text?” Canard78 provided a few examples of these parallels that he gleaned from “other sites.” In the following examples, canard78 took the information regarding the Book of Mormon from John Tvedtnes’ book, The Hebrew Background of the Book of Mormon. Rick Grunder’s Mormon Parallels quotes BYU professor Donald Parry who, in 2002, wrote that that Hebraism’s in the Book of Mormon “attest to the book’s Near Eastern background and antiquity. Their presence cannot be explained as a matter of coincidence, nor could a modern writer have integrated them so effectively (naturally and correctly) throughout the narrative.” These literary forms, Dr. Parry wrote, “were generally uncommon in, if not altogether foreign to, the English of Joseph Smith’s day.” Dr. Parry was mistaken. 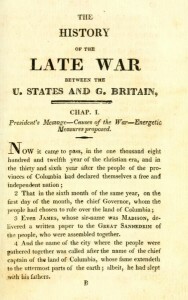 The Late War demonstrates that writing done in the biblical style, complete with integrated Hebraism’s, was a genre employed during the time, and in the place, of Joseph Smith’s youth. Therefore, Hebraism’s do not persuasively attest to an ancient origin for the Book of Mormon. This entry was posted in Book of Mormon, Mormon Scripture and tagged Book of Mormon, Gilbert Hunt, Hebraisms, Joseph Smith, Rick Grunder, The Late War. Bookmark the permalink. I’ve always hated that style. I suppose hundreds of years ago, it was normal. But I’ve never found the BoM’s employment of that style as persuasive. Not only is the translation supposed to be of ancient documents (well before the 16th and 17th century when the KJV was composed) when the documents were written, but it seems utterly unnecessary to use the language in modern times. So unnecessary, in fact, that I find it superfluous, obnoxious, and distracting. I know this is merely my opinion, but I have to admit I find it a stretch that anyone would rely on KJV sounding language as proof of anything. I just finished watching Chris Johnson’s presentation on YouTube. I didn’t see a link for it in this article, but you can just search his name or the talk title, How the Book of Mormon Destroyed Mormonism. I also thought the rather quick snippet about hebraisms was of greater significance then the time given it. The video is over an hour and a bit technical but interesting if you have the time or nothing to watch on TV. “they taught for doctrine the commandments of men ” . that are concerned about being safe from false doctrine should ponder that thought . So the KJV of the Bible is written in what Elizabethan English? Joseph Smith wanted the BoM to pattern after the Bible so it would stand to reason that he’d want it to sound as much like the KJV as he possibly could. Why would it be so hard to get into the mode of using Hebraisms? What was that book that the guy wrote that parodied the BoM. It was the Book of Z………, I forget. There are writing contests where people submit manuscripts in the style of some famous author. These “authors” are really good at mimicking the actual authors. So this idea that it would be difficult to copy some literary form is simply not true. Mormons keep on trying to prove that the BoM is the real deal and the only thing that they really have to offer is their personal conviction that it’s true. We have versions of the Bible written in modern English. These versions also have the advantage of scholarship that wasn’t available to prior translators. So, when will the BoM be translated into modern English? OOPS, I forgot, there is no original copy of Smith’s “translation” of those golden plates. What language was written on the golden plates? Do we have other documents that are also written in that language? Does anyone know what happened to the hand written “translation” of the golden plates? Are there any ancient texts that provide a record of a lost tribe of Israel getting in magic boats and coming to the North or South American continent? Is there any archeological or linguistic or DNA evidence that support the story told in the BoM? If the LDS church were going to do something major to their scriptures such as modernize the language or de-emphasize certain teachings then they would have done it last year when they updated their scriptures. Instead they realized that doing something such as modernizing the language would shake the ground of the faithful way too much so they are now dug down deep in their trenches and they know it. Their only real strategy now is “that’s not official.” For most investigators who come across the pseudo-archaic language they only hear it scream charlatan, but the Corporation don’t care. So long as they have 5 active members they can buy and spend billions on all the prime real estate they want while maintaining the tax exempt status because they are a recognized religion by the government. I feel very sorry for those poor souls who are victims of this scam machine. Actually it doesn’t matter what’s in the BoM or how it is written. As long as Mormons embrace an open cannon of Scripture, it’s the doctrinal wild west. The past is a big “so what”! Everything is evolving, changing, progressing. Even the Mormon god is evolving and progressing. As the Mormon god grows in wisdom and knowledge, he can share his growth and discoveries with his prophet. Now the problem is that practice sets-up a huge mess as old doctrines, practices and rituals are discarded and new ones introduced. Joseph Smith was a real ace as that is concerned. Brigham Young had a couple of guys follow him around writing down everything he said. He said that the sermons he preached were as good as any scripture anyone would ever hear. So with things so wide open, a prophet can never be wrong. Couple that with the assignment of the fail-safe “it was just his opinion” and/or “that’s just folk doctrine” and Mormonism is a stew that’s always cooking and having ingredients added or ladled out all the time. Falcon, Brigham Young taught that our God/Father in heaven is growing in knowledge but most Mormons today do not believe that or think about that concept. Modern LDS leaders reject that idea. Brigham reasoned thus that since eternal progression is infinite than so is the growth in knowledge infinite. It makes perfect sense in the context of mormonism. Their is no end in the progression of God. If the Mormon God is growing in knowledge than it should stand to reason that any God above the God of this earth is also growing in knowledge. Obviously this is a heretical teaching to the Christian faith. I was aware that this was BY’s little hobby horse and the controversy surrounding it. So much for prophets, right? What good are they? It’s the same sort of idea that Mormons teaching that the Mormon god(s) are eternal. Then when you examine it, it turns out that what they mean is that “matter” is eternal so therefore so are the gods. Totally bizarre. You are right. All of this is heretical to Christians. There is One God and He has attributes such as being omniscient or all knowing, omnipresent He is everywhere, omnipotent all powerful, immutable unchanging, holy, righteous, sovereign, loving and merciful. The Mormon gods, who are an invention of Joseph Smith, are all former men. That’s with the exception of Jesus who sort of reversed the process and was a god who became a man. All pretty weird none-the-less. on any doctrine or plan they introduce . This is the Mormon system . who formed this earth were : Elohim , Jehovah , and Michael . ” Mormonism supplies a consistent and positive theology ….it speaks with no uncertain sound. certain and conclusive . ” [ Why I am a Mormon , by Pres. Charles Penrose ] . similar to those who Paul mentions in Eph 4:14 . This is waaaaaaaay off topic but I noticed yesterday when I was watching the Badger/BYU football game that there were BYU players sporting tattoos. I thought that was a real no-no in Mormon culture along with men having long hair, beards or mustaches? Did one of the Mormon prophets have a revelation about this as of late? Anyway, can a Mormon man become a god if he has a tattoo? Im sure some LDS as usual wont agree, But I once asked a mormon if I ever would be able to move up the ranks from how I look, IE, 4 Tattoos, big biker type bushy goatee and at the time really long, way below the shoulders hair. My reply was, I can join the church, but will never be allowed to teach any classes and most likely wont be able to enter the temple. Thats Funny, God never said anything to that effect, We know Jesus had a beard, and while he did not have any Tattoos, He called the sinners to repent and took us just as we are. So I suspect if any LDS gives you an answer, it might be what he/she believes, But you will find another LDS who wont agree. Well for a long time I’ve felt that you were not god material. NO WAY! Becoming a god is serious business. You have to look a certain way, talk a certain way, behave a certain way over all and absolutely NO CAFFEINE. This is the Mormon god program and without wearing a special under-garment and doing Free Mason rituals in a Mormon temple you’re relegated to, maybe at most, the second level of Mormon heaven. However, I’ve heard that people can do the “work” in the next life. Is that true? None-the-less, a Mormon man is under a lot of pressure to get on board the train leading to the Celestial Kingdom. Is it true that his wife and kids will be given to another man if he doesn’t make it? The whole thing is a total farce! I have a better way. Come to a knowledge of the saving grace of God through Jesus Christ by faith and be totally born again. That’s it! We don’t deserve it. We can’t earn it. It is a gift of God not of works that any of us could boast. Mike’s comment regarding what BY taught in 1832 regarding the nature of God, that being quite conventional Christianity, got me thinking. Does anyone have a chronology of how things developed in Mormonism? What things for example, were tried and discarded. I’m wondering, did the Temple rituals precede the temple? So what were the big roll-outs? There was the BoM of course. There was the “priesthood”. They tried some socialism. There was the man to god “revelation” brought forth in the King Follett discourse. Someone had to flesh that out of course. Polygamy? A big one. Dumping polygamy, very big. Adam-god never got the traction as some of the stuff although if someone wants pure Brigham Young Mormonism, check out the FLDS. Now those folks are Mormons. On to blacks and the priesthood and then the changes in the BoM and also the changes in the temple ordinances. The WOW and the BoA were also added features. Baptism for the dead; when did that start? That’s still a pretty big deal with some of the sects of Mormonism. Others never got into it. So anyway, this restored gospel of Smith’s had the big feature of being changeable. My guess is that’s why there’s so many different sects of Mormonism. The restored gospel is pretty much a mess as I’m fond of saying and confusion reigns. Even individual Mormons have their own take on what it’s all about. So much for the need for prophets to reveal things! about the church which then leads to the religion being inquired about , that’s the goal . poor in P.R. skills . apostles —1 Tim 1:3-7 ( also 2Jn 7-9 ) . This problem is still here in our day —2Tim 4:3-4 .
teach and guide their flock because the Mormon church alone is Jesus’ church . revelation and the priesthood they have to depend on their own ideas for their guidance . inconsistent , unstable —not reliable . in the New Testament , the ones who imitation apostles in the latter days attempt to mimic . Rev 2:2 ; 2Cor 11:13 . I do disagree with that person’s point of view. If you joined the church now, after you had the tattoos done there is nothing ‘stopping’ you from being called to any position in the church or even going to the temple. If you joined the church first and then got the tattoos done – again there is nothing ‘stopping’ you from being called to any position in the church or going to the temple. One of the members of my bishopric has at least one tattoo that is visible with a short sleeve shirt on, and he was born into the church and served a mission – and is younger than me (I’m 42). The same with facial hair. There is nothing stopping anyone from having a calling or holding the priesthood if they grow a beard or mustache – unless they are an ftm transsexual. They may be asked (note may) to shave it if they get called to a position like stake president or bishop or a higher leadership position, but they still have their choice to keep it. The ‘no piercings, no tattoos, no facial hair’ are just guidelines, there is nothing in the temple recommend requirements (and thus in calling requirements which are less stringent) about these things. I have said this before, one of my friends joined the church in his late teens and was a surfer. His only clothing were tanks, cut-offs and thongs (for all you who are unfamiliar with the vernacular these are – singlet top, denim jeans cut off at the top of the thighs like shorts and flip flops). He was allowed to pass the sacrament dressed like this for as long as he wanted. He has since served a mission and as a bishop. It is all about the commitment and faith of the person to Heavenly Father, not their attire or tattoos, etc; however as pointed out by many on this site, the mannerisms after you have committed yourself to God should show a different being to the old – one more in line with His commandments and teachings. Thus there is a standard that can be shown in a person’s life (ie their works) that indicates their level of commitment and faith in Heavenly Father which is what all of these so called policies and requirements for living and temple etc in the LDS church are looking at when it comes to getting a calling or going to the temple. I do not know why the person you spoke with said what they did, you’ll have to ask them. I guarantee here in Utah this would never fly. He wouldn’t have made it through the front door of the church. I dare anyone to try this here. So, Ralph, its a merit based system? In Christianity it’s a “come as you are” party! God the Father accepts us as we are because through the blood of our Lord and Savior Jesus Christ, He sees us as perfect, without stain or blemish. In fact the Bible tells us that “our sins and lawless deeds He will remember no more” and “as far as the east is from the west so have I removed your transgressions from you”. Mormonism is a made up system of works where by the participant thinks he will become a god if he climbs the LDS ladder of success. It is another gospel, one made up by men. I suggest you embrace the gospel as it was once and for all delivered to God’s prophets and apostles. These are the ones who have the knowledge and wisdom of God and followed His dictates regarding how mankind can obtain eternal life. I find this post one of the more important at Mormon Coffee because it offers an explanation whereby Smith could have indeed manufactured the Book of Mormon from his imagination. Its proof of nothing, I realize that. But it certainly is not out of the question and adds to a long list of the story of Mormonism that should raise red flags.